A MEGA CITY forms the eVTOL's natural habitat. With its large sprawled out residential areas and huge traffic problems it feeds demand for eVTOLs. At the same time it may hinder the use of eVTOLs because of the noise they produce. 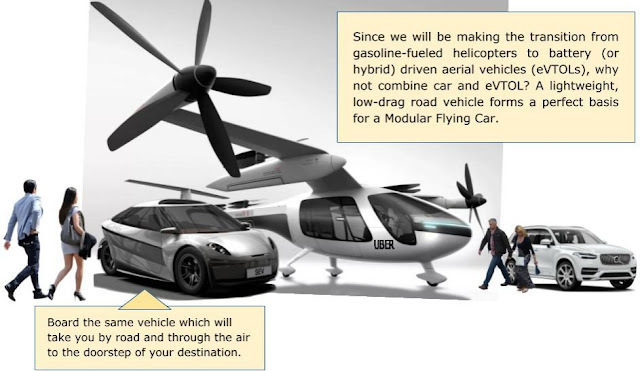 The more popular eVTOLs become, the more eVTOL traffic has to be organized and regulated, and the more vertiports you need. Plus the bigger some of them have to be to handle the traffic (an eVTOL trip becomes pointless if you get redirected to another vertiport). So far so good, since only 'economy of scale' will justify the considerable investments - in eVTOLs as well as vertiports. The more and the bigger the vertiports, the more noise. The more people want them away from where they live. The more you need the car to get you to and from a vertiport in the first place. UBER's vision of a vertiport is separate (ride-hailing) cars and eVTOLs. 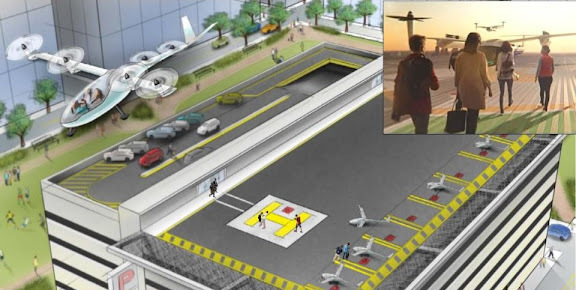 This means passengers crisscrossing over launching / landing platforms to get to their eVTOL or car - I would not be surprised if both FAA and NTSB prefer to see that done more safely. The whole switching between cars and eVTOLs can be done differently though. What was/is one of the biggest contributor to the globalization of international trade? 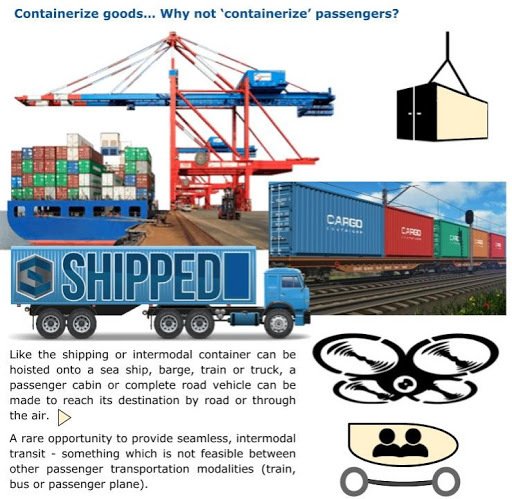 It's the shipping (or intermodal) container, right? It made forwarding goods much cheaper and go faster. Goods are stuffed into the container at the point of departure only to be opened at the place where they are supposed to arrive. What if you can do the same with people, put them in a container, carry them over short distances door-to-door? They step into the ‘container’ which is driven to a place where they are airlifted, hence flown to a place which is close to their destination, upon which they are again driven to be dropped off at the exact point of their choice. But now the ‘container’ comes in the form of a comfortable, streamlined cabin in which the passengers can stretch their legs and enjoy the view. 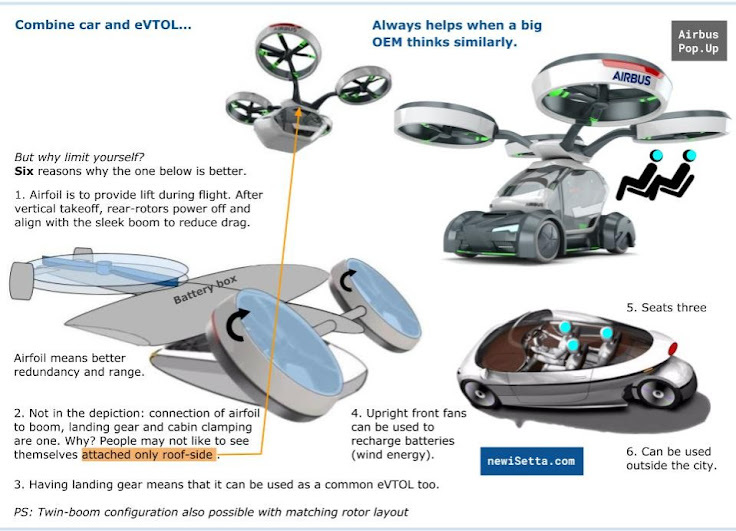 As long as the car and the eVTOL come from the same provider (TNC) or are meant to operate autonomously, why not put the two together like modules, with the passenger cabin at the heart of the combination? In both cases, the passengers don’t have to disembark. This saves time. We tend to put more functions in one device. Buzz words at the CES 2018 in Las Vegas were still platforming, eco systems and the internet of things - in other words, the trend of integrating and connecting things and applications. Why should it be any different for personal mobility? Below you see what may be a likely configuration (no push prop as was suggested in earlier drawings), with the front-fans in tractor mode, avoiding the vertical drag in hover mode that helicopters feature (rotors pushing down on the fuselage), plus larger-diameter rotors on the sleek, central boom. If so, why not put a detachable car in lieu of the passenger cabin? with road vehicle regulations as well as airworthiness requirements. Click on NEXT (green box below) to read why 'remain seated' is also better from a real estate point of view.